Now that the swarm season is here what do I do? Fail: The grass is to tall it must be kept short so the bees can ventilate properly. Fail: this strong colony needs to be divided, plus the winter cover is causing overheating in the colony. The swarm season is up and running. The trick with this is to at least keep it at bay the best you can and react before they leave the hive. Having an old queen in the hive. The hive wants a new queen, they achieve this with swarming. Queens cells are made and the hive swarms with the old queen when the queen calls are capped in the hive. The hive gets a young queen to carry on and the bees that swarmed look for a new place to setup shop. The swarm has alot against it to survive period. It needs to get established, grow in strength, an put up enough honey to survive winter. Overcrowding, there is nothing that sets swarming off like crowded conditions. Failure to divide a strong colony in May is a swarm ready to happen in June. If your hive swarms there will be no excess honey for the beekeeper on that hive. Heat, this is partly with overcrowding. A hive that can't keep itself ventilated will swarm. Keep the grass cut in front of a colony, remove the entrance reducer. Most colonies will not need entrance reducers after June 7. If it is a strong overwintered colony the do not need an entrance reducer anymore until fall. All queens cells are not the same. As beekeepers we need to know when a hive is truly in swarm mode. 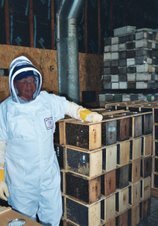 An inspection schedule of every 7 - 10 days to check for swarm cells. Active swarm cells have a larvae in them, peanut shaped, usually on the bottom of a frame, But can really be anywhere. Looking is the key. Bees will make cups on the bottom of frames but these are just for show. It is the larvae filled that is troublesome. The easy way to stop a hive that is hell bent on swarming is to do this: Hive A is in full swarm mode, Hive B is a weaker colony chugging along. Switch hives, move Hive A to where Hive B is and move Hive B to where Hive A is. What happens is the field bees fly out to forage. When they comeback they fly to where they used to live. Now Hive A the swarm hive gets weaker and Hive B gets stronger. Swarming impulse will diminish on Hive A and Hive B may turn out to be the honey producer. This method works every time and there is no problem with fighting. I caught the swarm in a cedar tree. It was about 6 - 7 lbs of bees. I sprayed them with 1:1 sugar syrup to get their wings wet so they wouldn't fly as much. I put a 5 gallon pail underneath them, a sharp shake of the branch and most of them fell into the pail. Dumping them into the hive is easy. After doing this three times, I had captured most of the bees. Being they stayed in the hive, the queen must have been in the mass. The white towel under the bees in front of the hive helps them crawl inside. There was so many bees they all did not fit in the 5 frame nuc box. I put them in a deep hive body the next morning with some feed. At present they like their new home and seem to be staying put. I will add these to my weakest colony in about three weeks. The swarm queen will be killed off because I don't know how old she is. By then the swarm should have 4 -5 frames of brood and drawn out the 7 frames of foundation I put in with them.The new combined hive will be strong and will produce honey this year. Had I not added the swarm, the weak colony would not have given me any extra honey. It was getting dark when I caught the swarm so the video quality is a little lame. When Do I put on the second box? What are the bees eating? I have been asked this question many times of late. I think anyone who was on the April 11th load should have put on a second box a week ago. The folks who were on the April 25th delivery are almost done drawing comb in the first box. I think by next Wed. or so, another box could be added. Remember if you are drawing out foundation there has to be feed on the colony at all times. Hive populations are growing. Foundation will be drawn out at a faster rate now. The bees will use a little more sugar water with the added bees. Now that the dandelions and fruit bloom is over there will be a dearth in nectar coming in. This will usually kick off the swarming impulse in strong overwintered colonies with older queens. Check strong colonies for swarm cells. Watch the food in the colony so the bees don't starve. The next major nectar flow will be the first hay crop. Alfalfa should start blooming in early June. The lack of water may hinder this date. Terry McD did a divide on her colony. Her method is different than what is taught at the U of MN but the outcome is basically the same. When she released the queen the workers were very content with her and made no attempts to kill her. Holding her for four full days then releasing her helps for queen acceptance. Finding a queen cell in a box. A Terry Mc D video. Terry found a queen cell. Rather odd because the hive wasn't that strong. Maybe the queen is showing her age being it was an overwinter colony. The bees might be trying to replace her. Why look at the brood? I had a customer call me. He said that his hive was dwindling. After talking about it I suggested maybe it was Nosema Ceranae. But he said he treated already with fumigilan. He has kept bees for several years and was confident with the process. He said he would go back and look again. He called me back later after another beekeeper looked at his colonies with him. It turns out he had American Foulbrood. 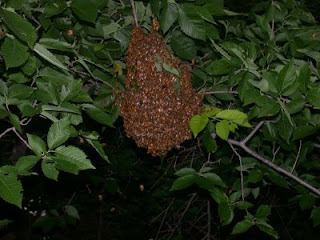 The discussion of the hive problem would have been diagnosed had I known that there was a brood issue. Word to the wise is if a hive isn't getting stronger pulling some brood frames will tell the tale. Anytime there is discolored and or misshapen brood there is usually a disease problem. While not always AFB, a clue there is a problem will help in finding a cure. Brood that is glistening pearly white is healthy. Any brood that does not look like that, there is a problem. someone else's honey to your bees, or through a colony robbing out a dying AFB infected colony. I have finished my night shift. I am back to normal hours. All medications should now be done with and should not be applied until after the honey supers are removed. Read the manufacturers recommendations and follow those directions. ie. Fumigilan, foulbrood and mite treatments. 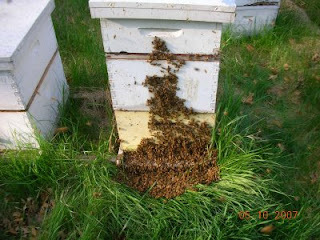 May 7th inspection of pkg and overwintered hive. Terry McD has made a new video. A May 7th inspection of two package colonies and an overwintered colony. The packages were from the April 25th delivery. Nice video Terry. The package bees are about at their lowest population and should be building up their numbers for the rest of the summer. Her over wintered colony had a much larger population as noticed by the extra noise and activity. My e-mail has not been working since last Friday. Hopefully I will have it going tomorrow or Wed. I will not be at the hobby bee meeting on Tues evening as my work schedule is five more days of night shift. Here in Stillwater my wild plums are coming into bloom. They are usually the first fruit tree I see around here in bloom. They bees love the pollen they get from them. I love to stand out in them to listen and watch the bees working the flowers. The blooms are very fragrant. Over the next two weeks we should see most of our fruit trees in full flower. The bees should have an abundance of pollen. Now if the weather stays warm and not to windy, the wind can affect the quality of the fruit blossom. Why divide an overwintered colony? There is my nectar flow. Up in a tree. I won't get honey from that colony. This colony is very strong and will swarm. Leaving the beekeeper with no excess honey for the year. This time of year many new beekeepers with overwintered colonies are unaware how strong their colonies are and how big they will get in a short period of time. If you have 8 frames or more of brood in your colony by around mid May dividing it may be the only way to stop it from swarming. I have a link about dividing colonies at the lower right corner of this page. If the beekeeper doesn't want more colonies there are people looking for bees right now and will be happy to purchase a divide from them. My work schedule has changed for 13 days starting Sat evening. I will be on the night shift for that time period. If you want queens this is how I have to do it. Anyone that wants a queen(s) after Sat May 2nd will have to call one day before they need it during the week. Leave a message on my voice mail of what you need and who it is for. I will get it ready and it will be available for pickup Mon - Fri, 5 pm - 7 pm ONLY. No one will be available after 7 pm. Sat. May 9th someone will be available 9 am - 3pm to sell queens.